54cm white freestanding cooker is rated 4.6 out of 5 by 14. 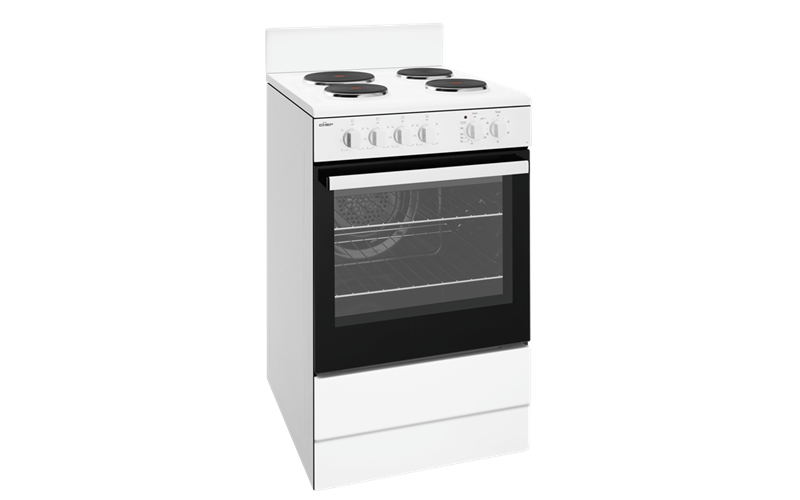 White 54cm freestanding cooker with fan forced oven, timer, light, grill in oven and electric hob with 4 solid hotplates. Rated 5 out of 5 by Margiebear from Better than I expected I bought this stove last month to replace a Euromaid (only 8 yrs old) which turned out to be an expensive piece of rubbish. So I bought a basic, no frills stove at half the price I paid for the Euromaid. I am so pleased with it. It is better than the Euromaid had ever been. I had been warned it would take a long time to heat up, but I have never felt that was a problem, and it cooks so well. My love of cooking has returned. Just love it. Wish I had bought this 8 years ago. Rated 5 out of 5 by Gore1954 from Simple design and easy to clean I purchased this oven about a month ago and it is perfect for my needs. The oven is fan forced only which is my preferred setting no complicated features and I love the fact that the oven door has an air gap between 2 the 2 glass panels. I have had other stoves where spills get between the 2 glass panels and the only way to clean it is to pull the oven door apart. Rated 4 out of 5 by Lone11 from It's a winner! For a budget range fan forced, this does the job beautifully. Bakes nice and even. Hotplates take a while to heat up and cool down. Only drawback is that there really should be a light, indicating that the hotplate/s are turned on. My former stove had this feature, and I really miss it. Overall, a really good stove. Very happy. Rated 3 out of 5 by LFM1 from Good Value We bought this for a holiday house which is rented to holiday tenants. The top of the oven is very hot when only one hotplate is being used. It was very good value but as children frequently are in the house i probably would have chosen differently had i known this. It does cook and the oven works well. Rated 4 out of 5 by Rypper from Great value I bought this about 6 weeks ago and have been generally really impressed. The oven is great - warms up quickly and seals well. The only issue I've had is getting used to the slower to heat up hotplates - which most solid hotplates are compared to the coiled type. A good value oven. Rated 5 out of 5 by Rosalia M. from Looks great, is working well - just a good design overall. I appreciated Appliances Online reviews and comments from previous customers to help me decide on this product. I would recommend this Chef model for anyone looking for a freestanding Electric Oven/Stove. Rated 5 out of 5 by Anonymous from I bought this Oven/Stove for a rental property. I'm assuming all is going well with the appliance! My tenant was extremely happy to have received it.